Donkey Kong Arcade - Think you can beat it? Home Retro Gaming News Donkey Kong Arcade – Think you can beat it? In many respects the game that built the House of Nintendo, the original Donkey Kong arcade game is a classic for the ages – and rightly so. 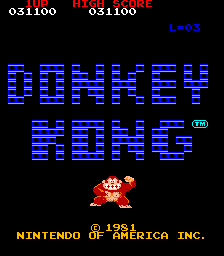 Featuring some of the most challenging – and addictive – gameplay of its time, the original Donkey Kong arcade game went on to become a phenomenon that was ported to nearly every format during its heyday. Originally released in 1981 and developed by Nintendo’s Research and Development 1 as well as arcade cabinet maker Ikegami Tsushinki, the original Donkey Kong arcade game was actually a last-minute switch out of Nintendo’s less well-received Radar Scope arcade game. Led by Shigeru Miyamoto, the original Donkey Kong helped pioneer not only Nintendo’s unique brand of platforming but also their signature graphical and art style. Interestingly, this was Shigeru Miyamoto’s first time leading a project at Nintendo – and would they ever be grateful they let him do his job. Then Nintendo President Hiroshi Yamauchi needed a game that could put the company back on the map in the video game industry and entrusted Miyamoto with this task. Not only did Miyamoto achieve this spectacularly but also set the wider company on a course to challenge and best rivals such as Atari and Sega. Having himself come up with most of the Nintendo pantheon, Miyamoto’s humble beginnings with the Donkey Kong arcade game is both a testament to taking chances and a watershed moment for the industry. A lot of the game’s difficulty comes from its then novel approach to a platforming title, a genre that was nascent at best. Though this would later evolve into the side-scrolling stages seen in the Mario titles and the 1990’s Donkey Kong Country for SNES, the original Donkey Kong arcade game showed this in concept and helped establish some ground parameters that would go on to become gaming conventions. Among them include dying from a fall, dying from touching an obstacle or object, and oncoming enemies or projectiles. It was a breath of fresh air for a segment that was otherwise filled with clones of more popular Atari titles. But it is hard and this fact alone is probably going to be a big turn off for many gamers. You better put your hard hat on when playing this game as it will absolutely show no mercy. 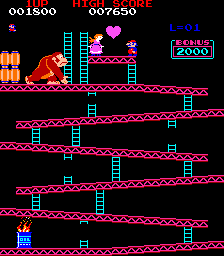 With a difficulty curve as steep as a sheer cliff, Donkey Kong never feels cheap or gimmicky. In fact, the difficulty makes it even more compelling. Not only is it a title that rewards mastery but it encourages it. That’s probably a good thing given the game had to make money by literally bringing people back time and again, but it is also a hallmark of solid game design that Nintendo has mastered now. Though an absolute underdog when Donkey Kong was released, Nintendo’s emphasis on remaining scrappy and sticking to their strengths is a tradition that was established with the Donkey Kong arcade game whose success put the company on a course that it has rarely deviated from since the game’s release.